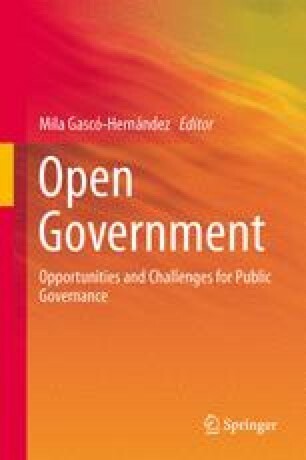 This chapter provides a picture of some issues that should be considered during the design and implementation of open-government initiatives, based on the analysis of four Italian case studies at the sub-national level. Specific attention is given to the contextual rigidities which may jeopardise the implementation process, in contrast to the opportunities provided by the use of ICTs. The study suggests that the availability of open data may allow greater autonomy to the public institution wishing to develop a certain tool to support policy-making or public services provision. Where the relevant data are ‘non-open’, the institution needs to foster cooperation with the subjects, be they public or private, who hold the data. Open data therefore reduce the coordination costs of these initiatives. On the other hand, whenever implementation requires cooperation among different administrations, the willingness to collaborate needs to be verified and promoted, and not taken for granted. The commitment of the individuals at the apex of the leading organisations is also confirmed as critical for the overall success of the initiative. These cases also suggest that open government may support higher effectiveness of public services provision through a better understanding of citizens’ needs. This can lead to the co-definition of such needs, and not only—as in most forms of current public engagement—of the answers to those needs. An additional benefit relates to the possibility of enhancing also the effectiveness of these answers, as they become more modular. Berners-Lee, T. (2006). Linked Data–Design Issues. http://www.w3.org/DesignIssues/LinkedData.html. Accessed April 8, 2013. Leadbeater, C., & Cottam, H. (2008). The User Generated State: Public Services 2.0. http://www.charlesleadbeater.net/archive/public-services-20.aspx. Accessed April 10, 2013. Smith, M., Engler, N. J., Christian, G., Diga, K., Rashid, A., & Flynn-Dapaah, K. (2008). Open ICT4D. http://web.idrc.ca/uploads/user-S/12271304441Open_ICT4D_Draft.pdf. Accessed April 10, 2013.